One of the few design problems with the Leica M3, M2, M4, M4-2, M4-P and M5 -- and most cameras made before the mid 1970's, is a metal eyepiece which will scratch the hell out of your glasses. These ingenious little vinyl donuts take care of the problem. 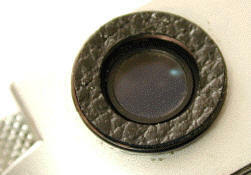 Just remove the adhesive backing, stick the donut on your eyepiece, and live in scratchless security. Cost ? $15 for one, $20 for two, including 1st Class postage within the US. Add $1 for postage outside the US. If you wear glasses and have one of these earlier M's, you NEED these! In Stock. Before I started importing these, I tried to make them myself, and soon learned it was not nearly as easy as it might look, at least not if you have eleven thumbs like I do. Although made to fit the Leica M eyepiece, you can adapt them to many other cameras with metal eyepieces as well. Adjust the size by cutting the donut in half, and either removing small portions, or opening it up a bit before sticking it on the eyepiece. After only 40 years or so, the M eyepiece may have residue oils which won't allow the eyeglass protector to stick. 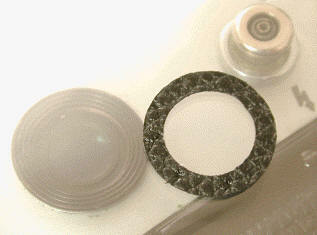 Clean the eyepiece off with a small amount of lens cleaning fluid before applying the eyepiece protector. PAYMENT METHODS: Any payment method if ordered with other products. IF the donuts are ordered by themselves, US check or International Money Order only. For details of payment options CLICK HERE . Revised: February 05, 2007 . Copyright © 1998-2006 Stephen Gandy. All rights reserved. This means you may NOT copy and re-use the text or the pictures in ANY other internet or printed publication of ANY kind. Information in this document is subject to change without notice. Other products and companies referred to herein are trademarks or registered trademarks of their respective companies or mark holders.